What do you get with purchase? Where do UPC codes originate? Who can legally sell UPC codes? What is a UPC bar code? What products need a UPC bar code? How can you print your own UPC codes? How do you get a UPC number? What size should my bar code be? Where should the bar code be located on my product? Are there online resources to make a UPC bar code image? How do I list my product codes online? This eBook comes free with every purchase of UPC code numbers or UPC bar code printing software. You can also get a free copy right now by Tweeting about it. (Just click the Pay With a Tweet button.) Finally, you can buy a copy of the eBook for only $2.99. Find out everything you need to know about UPC codes before you make a mistake! This eBook is an invaluable resource for people who make and sell retail products. 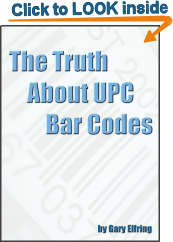 This book even provides detailed information on other UPC related bar codes, and why you need them. Don't be confused by Shipping Container Codes, ITF-14, GTIN, or other retail bar code formats. Learn all about them here. This eBook also includes a bar code terminology section that explains all those confusing bar code related acronyms.